Bookshop Talk: ALL CREATURES GREAT AND SMALL by James Herriot, 1972. 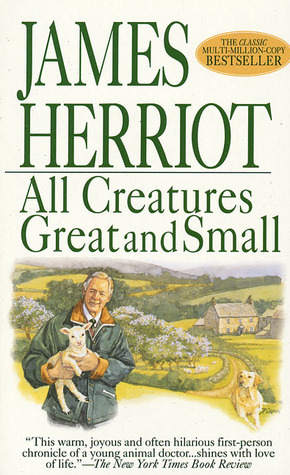 ALL CREATURES GREAT AND SMALL by James Herriot, 1972. 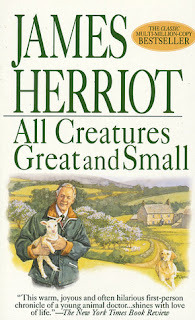 I’ve just reread All Creatures Great and Small by James Herriot (1972). James Herriot (real name: James Alfred Wight) was a veterinarian in rural Yorkshire in the 1930’s. He wrote a series of memoirs of veterinary life, published from the 1970’s through 90’s. I first read the series in high school, then reread it soon after graduating from vet school. Each chapter is only a few pages long, a vignette of a particular patient or client. Although he talks about medical issues, the stories are more about the people—their personalities, attitudes toward their animals, and relationships with family and neighbors. For example, one chapter is framed around an old dog in congestive heart failure, but the real spirit of the story centers on the dog’s owner, a little old lady whose love of her pets—and Herriot’s assurance that animals have souls—help her find the courage to face her looming mortality. I realised, quite suddenly, that spring had come. It was late March and I had been examining some sheep in a hillside fold. On my way down, in the lee of a small pine wood I leaned my back against a tree and was aware, all at once, of the sunshine, warm on my closed eyelids, the clamour of the larks, the muted sea-sound of the wind in the high branches. And though the snow still lay in long runnels behind the walls and the grass was lifeless and winter-yellowed, there was a feeling of change; almost of liberation, because, unknowing, I had surrounded myself with a carapace against the iron months, the relentless cold. As a veterinarian, I also love to read Herriot because I’ve encountered many of the same situations with my patients and clients. It doesn’t matter that he practiced large animal medicine in England in the 1930’s while I’m practicing small animal medicine in America in the 2010’s—people and animals are the same all over. The opening line is: “They didn’t say anything about this in the books, I thought, as the snow blew in through the gaping doorway and settled on my naked back.” (He’s pulled off his shirt to reach deep into a cow to deliver a stuck calf.) Yup. I can think of hundreds of situations when I thought, They didn’t teach me this in vet school. Like, how do you repair a lacerated tongue on a cockatoo? How do you treat a seagull with head trauma? What do you do when a scared feral cat is running amok in your surgery suite? Recommended for anyone who loves animals, England, or plain old good writing.